• “Riveting account of actual events and their startling twists and turns.” • “Haunting psychological cliffhanger of terrifying abuse, unrelenting brainwashing attempts, and one child’s determination to survive and thrive.” Arthur M. Bodin, Ph.D., ABPP Former President, Division of Family Psychology, American Psychological Association “A gripping account of the effects of a child’s continual trauma and her struggles for physical and emotional safety. Tracy May balances the horror of relentless threat and fear with acts of kindness from others. A courageous and inspirational story filled with huge characters and major legal precedents. Once I started reading the book, I could not put it down. As a psychologist, I recommend this exceptional addition to the understanding of trauma and recovery.” Joseph Keenan, Ph.D. “A child’s terrifying journey through severe and pervasive family dysfunction and many forms of child abuse, including parental alienation. The story reflects a keen understanding of coping with adversity. A powerful and moving testimonial to the strength of the human spirit and a must read for anyone moving on from a stormy past.” Andrew Newman, M.D., FCCP Keeping Mother’s Secrets is a gripping memoir of a child’s courage to survive terrifying physical, emotional and sexual abuse. It has many unpredictable twists and turns as the child, Tracy, clings to hope and finds a way to thrive. This brave, honest and graphic account is enhanced by legal documents and the memories of others who were involved. 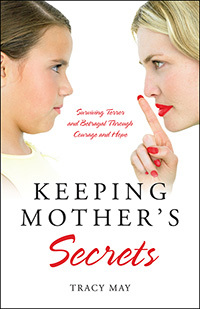 Keeping Mother’s Secrets is an inspirational read that will engage, enlighten and fascinate the public. It also offers hope to those who have suffered abuse and trauma. TRACY MAY explored many paths to gain the knowledge and tools which enabled her to grow from a child barely surviving to an adult who is thriving. Tracy resides in Sunnyvale, California. © 2019 Bounceback Press. All Rights Reserved.